Fenugreek is one of the oldest cultivated medicinal plants native to southern Europe and Asia. The name itself has an exotic ring, and it should, as widely traveled as it is. A very popular plant grown throughout Mediterranean regions, Argentina, North Africa, France, India, and the U.S., fenugreek is mentioned in detail in Egyptian papyrus writings circa 1500 B.C. Because it’s been used in so many cultures, this is one herb with a lot of different monikers: bird’s foot, Greek hay, and bockshornsame are a few. After purchasing, fenugreek can be stored in a cool, dry place for up to six months. 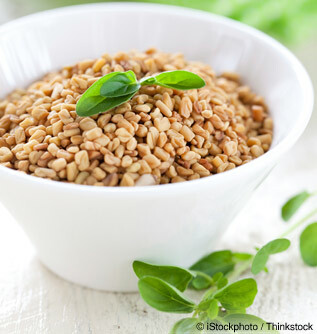 Fenugreek seeds are rich in minerals such as iron, potassium, calcium, selenium, copper, zinc, manganese and magnesium. In the vitamin department, it contains thiamin, folic acid, riboflavin, pyridoxine (vitamin B6), niacin, and vitamins A and C. There are also polysaccharides: saponins, hemicellulose, mucilage, tannin, and pectin, which help lower LDL (bad) cholesterol levels by discouraging bile salts from absorbing into the colon, while at the same time binding to toxins so they can be escorted from the body. The amino acid 4-hydroxy isoleucine in the seeds helps lower rate of glucose absorption in the intestines, which lowers blood sugar levels in patients with diabetes. It’s notable that 100 grams of fenugreek seeds contain about 323 calories, and that the fiber content is quite high, which may have something to do with one traditional use for this product in the Middle East – to gain weight. Areas of the Middle East and North Africa are noted for grinding the seeds into a paste to be taken with sugar and olive oil. The seeds also add to digestive bulk, which helps prevent constipation. The paste is also applied topically to fight infection and inflammation in wounds, and the herb portion is used to treat diarrhea and stomach ulcers. Fenugreek contains choline, which studies show may not only help slow mental aging, but also calm PMS and symptoms of menopause. Fenugreek is also considered an aphrodisiac, and plenty of studies tout its ability to increase libido in men. There are also those who attribute to fenugreek the ability to promote breast growth in women, although no studies prove it decisively. But another key compound, diosgenin, has been shown to increase milk flow, which makes this herb very popular among breastfeeding mothers. However, fenugreek can cause uterine contractions, so it’s advised that pregnant women avoid fenugreek in any form. Research also indicates that the diosgenin in fenugreek may play an important part in inhibiting several types of cancer. A double blind placebo controlled study was conducted on 25 newly diagnosed patients with Type 2 Diabetes to determine the effects of fenugreek seeds on glycemic control and insulin resistance in mild to moderate type 2 diabetes mellitus. After two months, blood glucose levels as well as insulin were significantly lower. The conclusion: the use of fenugreek seeds improves glycemic control and decreases insulin resistance in mild Type 2 Diabetic patients, with a favorable effect on hypertriglyceridemia (associated with an increased risk of cardiovascular events and acute pancreatitis) as well. In another study, scientists demonstrated that fenugreek seed extract (FE) are cytotoxic in vitro to certain cancers, but not normal cells. Treatment with 10-15 ug/mL of FE for 72 hours inhibited the growth of breast, pancreatic and prostate cancer cell lines, at least in part due to induction of cell death. Researchers noted that fenugreek is one of many “dietary components” with therapeutic potential. Heat oil in a medium saucepan. Add cumin and chili into oil. When the cumin sizzles, add onion and sauté on medium heat until onion is soft. Add ginger and garlic and cook for 2 more minutes. Add lentils and turmeric to saucepan and stir. Pour in 4 cups of water and bring to a boil. Reduce heat to low, cover and simmer until lentils are cooked – about 12 minutes. Meanwhile, wash fenugreek leaves and tender stems, discarding the rest. Measure 1 cup of fenugreek greens to stir into the dal for 2 minutes toward the end of cooking. Stir in lemon juice, and salt. Use as a topping over seasoned basmati rice or rice noodles. Roasting and grinding of fenugreek seeds are advised before food use. Studies show it not only has the ability to lower blood sugar levels but fight cancer. Try grinding a few tablespoons into your next stir fry or soup. You might discover a new secret ingredient.